Betty Schaefer and Dale Marston were students at University of Illinois as World War II was brewing on the other side of the world. She was a freshman studying home economics, he was in his second year of chemical engineering. They lived in neighboring boarding houses, and the meals for the dozen or so students were served at Betty’s. That’s where the couple met, in the old version of college dining halls, almost a sign of the many, many meals they were to share in their future. In August 1941, Dale was called to report to the Army in Washington. He had already “pinned” Betty with his fraternity pin, essentially a sign of their engagement, but the time for a no-frills wedding came much sooner than they expected. Betty left school and the pair traveled to St. Louis, where there was no waiting period to get married. They moved east, and started their lives together on $125 month, renting a $40 apartment. 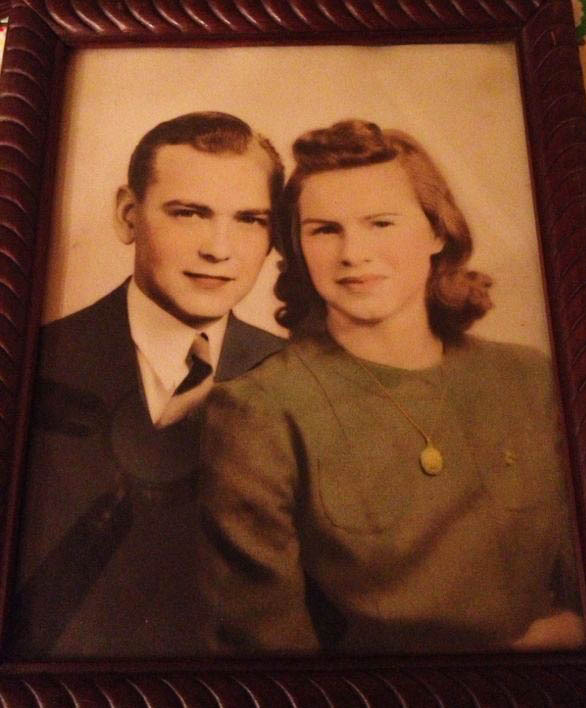 During their 71 happy years together, my grandparents raised three daughters (my mom is the youngest) and one son at their house on Williamsburg Boulevard in Arlington. He worked at the National Security Agency, breaking codes, and she was primarily a homemaker. Over all this time, they have so clearly always been in love with each other. I remember seeing my Grandpa put his hand over Grandma’s just a few months ago. Something so simple but such a testament to their lives together. They now have 10 grandchildren (9 are girls!) and 11 great-grandchildren. Babies, puppies and kittens always brought a smile to her face, no matter the state of her mind. Grandma and I sharing a piece of cake in Arlington. My grandfather, stubborn and always an animal lover, had convinced one of the caregivers to take him to the SPCA last summer. Their adopted golden kitten, Winkie, brought a smile to Grandma’s face these last few months. 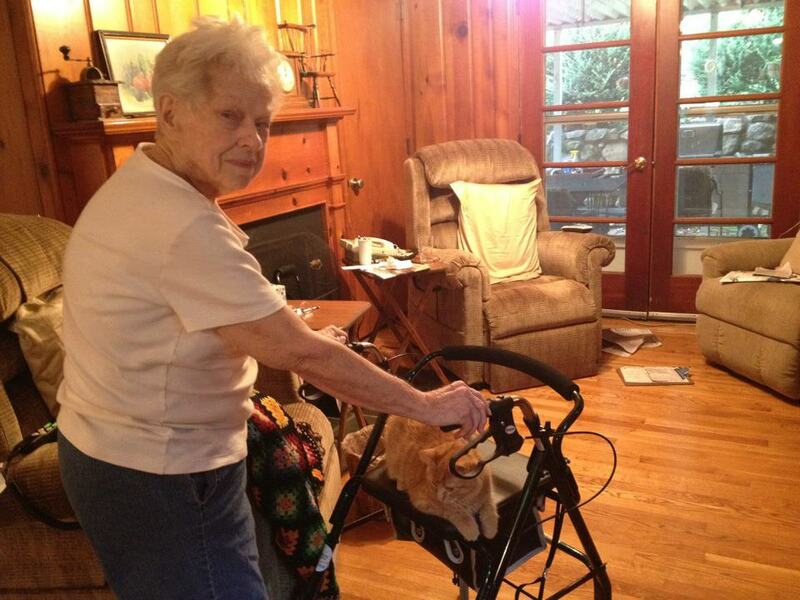 She sometimes said that the cat didn’t like her–but just take a look at one of the kitten’s favorite activity, riding on her walker. Looks like love. 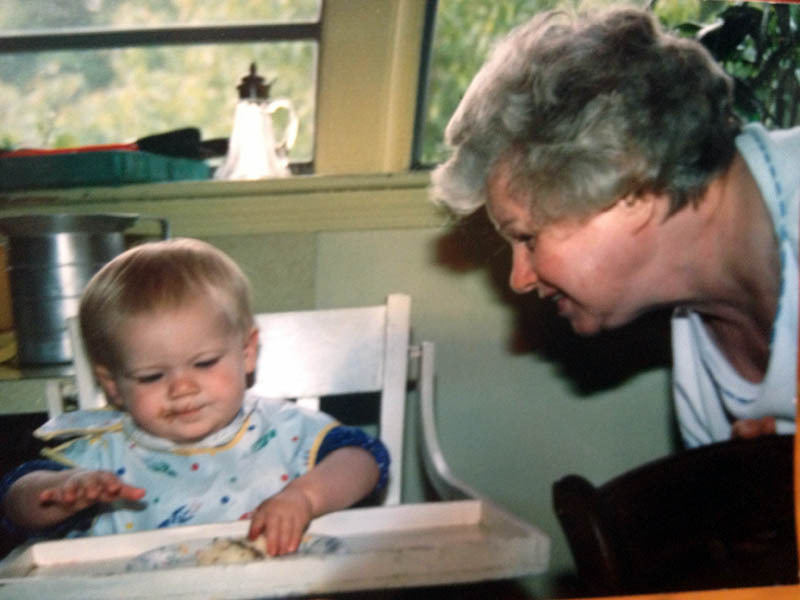 My grandmother died last Wednesday, after a very difficult two years that took a toll on her mind and health. She didn’t recognize most of us anymore, though her mouth would curl up into a little smile–as if to say, I knew you at one time, and I wish I could remember. Here’s the obituary I wrote to run in three newspapers. My many relatives from Colorado and North Carolina will all come together to say goodbye next weekend, and to comfort my grandfather, heartbroken after losing not just the love of his life, but his other half for longer than any of us can imagine. 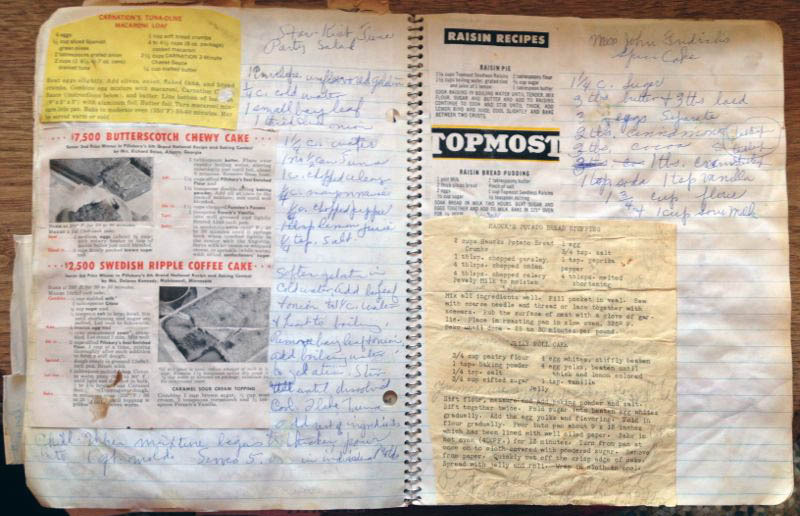 I remember her always copying recipes from my mother’s food magazines and cookbooks in her beautiful cursive onto scraps of paper. She’d tear particularly good recipes out and pile them up in her home or make them into some type of scrapbook–just like my mom and I both do now in our modern versions with binders and sheet protectors. Obviously the food-loving trait has successfully passed down through the Marston line. This weekend, when Aunt Susie, Uncle Tom and Aunt Annie were in town, I baked my grandmother’s Hot Milk Cake for us to eat at Grandpa’s house. The Betty Crocker recipe was something she’d whip up regularly for dessert, my mom told me. Grandpa said he’d be put in charge of mixing the custard that is layered between two round sponge cakes. It’s essentially a Boston Cream Pie with a dusting of powdered sugar instead of a chocolate glaze. My mom had texted me Wednesday, just a few hours after Grandma died, that it felt like she needed to make a hot milk cake. Besides a symbol of love, food is a source of comfort for us. Rice pudding became my dinner that night, before I traveled home, in memory of her love of desserts made with milk. She always wanted to be sure that her children received their servings of dairy! 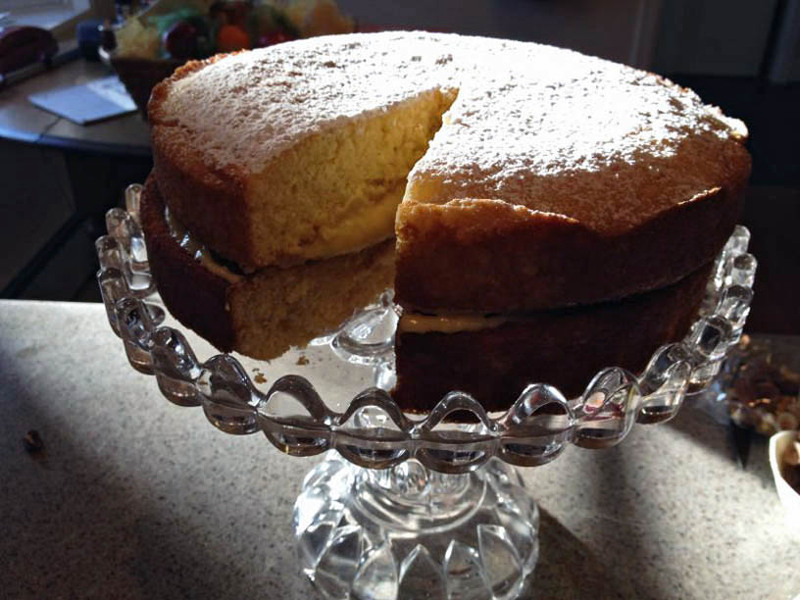 The hot milk cake turned out wonderfully, and satiated us all for the afternoon, with our memories of Grandma Betty and stories of her life, and of course, her favorite foods. Adapted from Betty Crocker, 1950 edition, which calls this cake by “Inexpensive Sponge Cake” but my family always knew it as Hot Milk Cake. My grandmother made two round cakes and spread a double-batch of pudding/cream filling in the center. I’ve doubled that recipe already below. Grease and flour two 9-inch cake pans or a 13×9 pan. Beat 4 eggs (with rotary beater, according to Betty Crocker) until very light. Beat in 2 cups sugar, 1/2 tsp. salt, 2 tsp. flavoring (I used vanilla extract). Beat in 2 T. butter that’s been melted in 1 cup boiling hot milk. Sift together and beat in (very quickly) 2 cups sifted cake flour and 2 tsp. baking powder. Immediately pour into prepared pan. Bake at 350 degrees for 20-25 minutes until cake tests done. Cool. For cream filling: In a pot, mix together 1/2 cup sugar, 2 T. cornstarch, 1 tsp. salt, 2 cups rich milk or cream. Bring to a boil, stirring constantly, for 1 minute. Remove from heat. Pour a little over 8 egg yolks, slightly beaten, while mixing to temper and not scramble the eggs. Blend mixture back into hot mixture. Cook, stirring until thick, 2 minutes. (You can also use a double boiler.) Remove from heat. Add 1 T. vanilla. Chill a few hours until cream sets. Spread filling between the two cake layers. Enjoy! What a beautiful story Katie! We’ve got to try this cake in your Grandma’s honor!!! Please know we are all thinking about you and Emma and are hoping you are doing okay. Disaster! The whole thing went really lumpy when I added the flour!! I tried everything, even whisking it but no luck. I finally pushed what I could through a sieve but as it cooled it became more difficult. I did cook what was left and added some more flour to make up for what was left in the sieve but it is certainly not sponge-like after all that whisking! I’m not sure what I did wrong. I made this today. My cakes are cooling now. I made the cream filling as written. Its a little salty. I was just curious if 1 tsp of salt is correct. Nevermind…the pudding didn’t taste as salty once it was cold, which is still confusing to me haha. The pudding was a great compliment to the cake. It was a hit with everyone that had it. I will definitely save this recipe and make it again! Thank you! Made this cake tonight and it was wonderful!